Shridhar Malagi (Age 18 Years) a well known Physically challenged and Successful swimmer from Belagavi is selected in Indian squad to participate at 3rd Asian Youth Para Games-2017 to be held at Dubai from 10th – 14th December 2017. Shridhar is participating in 100 Mtrs Free Style, 100 Mtrs Back Stroke, 100 Mtrs Breast Stroke and 100 Mtrs Butterfly events. Shridhar Malagi along with his Coach Umesh Kalghatgi. Master Shridhar joined swimming in the year 2012 and has 27 Medals in his kitty , most of them won at National level. He has got 20 Gold, 5 Silver, 1 Bronze Medals as of now. 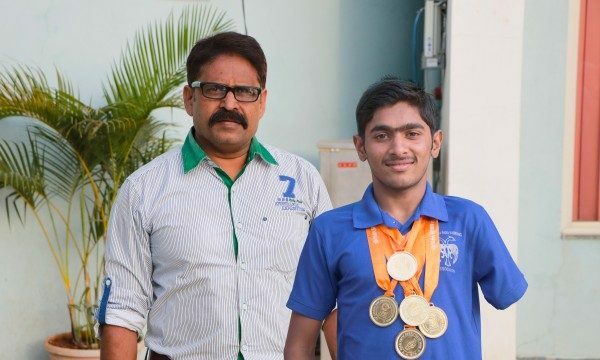 His latest addition was the 5 Gold he won at the 17th National Para Swimming Championship 2017 which was held at Udaipur in November 2017. He has also attempted Sea swimming. Shridhar is a member of Swimmers Club Belagavi and Aquarius Swim Club Belagavi and does his swimming practice both the session at Suvarna JNMC Olympic Size Swimming Pool and Rotary Corporation Sports Academy’s Swimming pool under the watchful eyes of swim coaches Mr. Umesh Kalghatgi, Mr. Sudhir Kusane, Mr. Prasad Tendolkar, Mr.Anandeshwar Patil and Mr. Rajesh Shinde. Go Sports Foundation has also come up to support this talented young swimmer. Shridhar living with his 3 elder sisters and parents in the suburb of Majagaon. His father works as a helper in Udyambhag factory and his mother works as a domestic help.